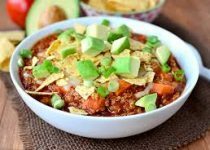 Don't forget the toppers for a great presentation and taste pairing on this delightful turkey chili. 1. In a large stock pot saute onion and celery in oil until soft. Add ground turkey, breaking up and cooking until no longer pink. 2. Stir in seasoning and water, cooking for 4 minutes. Add remainder of ingredients and stir. 3. Cook uncovered on low for at least an hour. 4. Season with salt and pepper if desired. Serve with toppers and sides such as nacho chips or crusty bread.